Now, they've made one for us! The college students have come and gone and not having been in Fiji at the time, their visit didn't translate into a blog post. Now, by pure chance, I've stumbled across this series of photo galleries , and boy: does this look like somebody had a blast - or what! And who, please, did take that picture??? Kudos to the indomitable ex BAD girl and now Broadreach bigwig Tiff (manifestation of God???) and to group leader Imogen who I hear did an excellent job both professionally and also in terms of being a pleasure to work with! Wanna have a blast and learn plenty of Sharky stuff in the process? Check out the Shark Behavior and Conservation Program! Too young? Check out this! The Ozzies were clearly too naïvely optimistic: Trust the Europeans to eff it up at the very last minute! The guys didn't even wait to look at the "latest assessment" by the ICCAT as originally announced but have already decided to drop the demand to have the critically endangered Northern Bluefin Tuna listed under CITES I. The instigators of this turn-about: Malta and Spain! Having contributed to the demise of the Canadian Cod Fisheries and cleaned out the Atlantic (shocking study here!) in general and the Mediterranean in particular, the Spanish Fisheries are now poaching Tuna in the South Pacific. And in case you wondered why a Shark conservation blog would bother to rant about the plight of the Tuna, read this: yes Spain is now one of the principal suppliers of Shark fins! Sharks may have been mere bycatch once - but now, Spanish fishing boats are specifically targeting them and finning them "clandestinely", meaning that everybody knows but nobody does anything about it! As to Malta, what can I say. 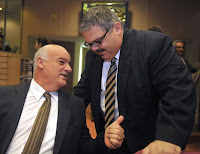 Meet George Pullicino (standing next to Maltese European Fisheries Commissioner Borg in this pic), the big (!) honcho in charge of Fisheries - and apparently, as pro-Fish-killing and anti-Conservation as they get! On his "watch", Malta's fishing industry is progressing from fishy to fishier to outright brazen. Talking of which, the latest scandalous development is George's blatant ignoring (as in deleting of e-mails, unopened) of the pleas by our friend Alex to stop the indiscriminate slaughter of the Med's last Angel Sharks, a genus which is protected under European Law. ...angel sharks are to be released whenever caught in all EU waters and may not be retained on board. This is clearly stated in Annex III (point 19) of our Fishing opportunities Regulation for 2009 (EC No 43/2009). The pictures you show are clearly an evidence of non compliance on this provision. and signed by César Deben, Director - in the name of Borg! It couldn't be more unequivocal than that! Kudos to Alex! And shame on George! But back to the Tuna. The proposal by the Commission was defeated by an unholy alliance of Mediterranean Countries comprising the two ring leaders and Greece and Cyprus. And France, another one of the notorious quota violators who came back on their word! And Italy, equally guilty! Yes that would be a paltry six nations, many of which culpable of multiple violations of current Law, blocking a proposal that is supported by a overwhelming majority of twenty-one! Don't we just love Federalism! 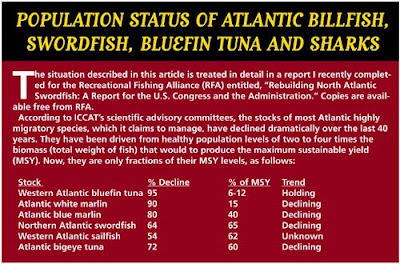 I read that apparently, Monday's move postpones a decision on whether to place bluefin tuna on an endangered species list. EU environment ministers are now expected to reach a final position by the end of the year. According to one of his pals, Marty has a streak of sea luck a mile long. I'm surprised the tiger didn't show. Well, none did - but whereas Timbo had to make do with a few, albeit large Bull Sharks, Marty came for only one measly day of Shark diving and got swamped! 25 Bull Sharks at the end of September is just simply unheard of! He may have been incredibly lucky - but once presented with the opportunity, being the consummate photo pro he obviously is, he sure knew how to capitalize on it! 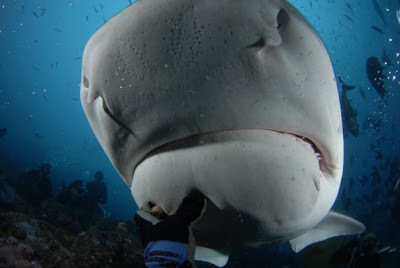 Mind you, nobody gets close to the biggies on his very first day of Shark diving - and yet, Marty did manage to capture some truly memorable Bull Shark vistas which I'll be certainly using on this blog. For now, I've chosen this remarkable capture of Manasa and his Grey Reefs - click on it, it's just simply fabulous! Titled Passing Fancy, it is a whole story in itself. Among many other things, it is also a tribute to Papa's incredible luck, willpower and discipline. Yes, it's now two years since he had a fatal heart failure and was very fortuitously resurrected by the prompt intervention of a passer-by. What followed were months of treatment, some of which radical, and a complete change of lifestyle and dietary regime. Papa is now back where he belongs, among his beloved Sharks. Being relegated to the shallows only, he has made the best of his predicament and re-modeled the small Shark feeds from what was essentially an afterthought into a stunning show where clients have the opportunity to get up close and personal with some of our most visually stunning little friends - to the point where the 4m feed may well be called the coolest safety stop in the world! Two very lucky, and nice men linked by a picture. 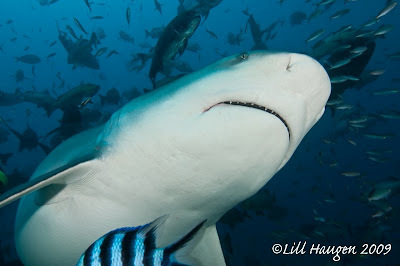 She turned up approximately ten days ago and quickly became the star of the current lineup of Bull Sharks. I've seen here side-by-side with our biggest matriarch Granma and she is undoubtedly more massive and more powerful - and quite possibly, even longer, which would translate into more than 11 feet! Lemme tell you, that's a whole lotta Bull!!! We've named her Naughtylus, in homage to the fabled sub - mobilis in mobili indeed! And because her rather sinister smile (click on pic) is more than matched by an ample dose of assertive posturing. Suffice to say that Bum, currently in the final stages of pregnancy and accordingly ravenous, meekly defers to her approaches! She's already proceeded to square up to this scribe and I can assure you that she certainly managed to catch my attention! Well, she will eventually mellow - like they all have once they realized that we got enough for everybody and that we demand a modicum of decorum from our dinner guests. We're currently updating and completely re-vamping our Bull Shark page, but at latest count, she's our 69th named Bull! Talking of which (no, I'm not posting any links! ), she nearly ended up with a completely different name! Yes these are boats! Click on pic! I've blogged about it before: if you thought that the main consequence of CO2 emissions will be Sea Level Rise, think again. And no, it's not a conspiracy! Ask the Pacific oysters! Want to watch a lecture about the whole disheartening fiasco? Grab a bag of popcorn and sit back - yes, it's half an hour long! Things have certainly not improved since then in 2005! When BBC reported it today, I was speechless. Apparently, Palau is declaring the world's first Shark sanctuary within all of its territorial waters. In April, it looked like they wanted to repeal their already existing pro-Shark legislation - and now this! Talk about a change of minds! 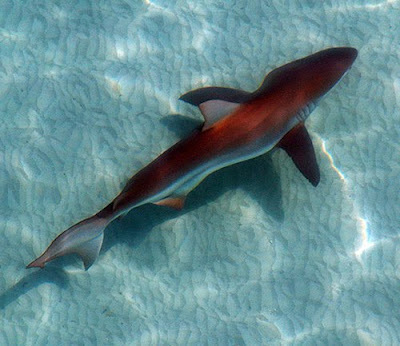 UNITED NATIONS — The tiny Pacific nation of Palau is creating the world's first shark sanctuary, a biological hotspot to protect great hammerheads, leopard sharks, oceanic whitetip sharks and more than 130 other species fighting extinction in the Pacific Ocean. But with only one boat to patrol 240,000 square miles (621,600 square kilometers) of Palau's newly protected waters — including its exclusive economic zone, or EEZ, that extends 200 miles (320 kilometers) from its coastline — enforcement of the new measure could be almost like swimming against the tide. Palau's president, who is to announce the news to the United Nations General Assembly on Friday, acknowledges the difficulty of patrolling ocean waters nearly the size of Texas or France with a single boat. But he hopes others will respect Palauan territorial waters — and that the shark haven inspires more such conservation efforts globally. "Palau will declare its territorial waters and extended economic zone to be the first officially recognized sanctuary for sharks," Palauan President Johnson Toribiong told the Associated Press in an interview Thursday. Shark fishing has grown rapidly since the mid-1980s, driven by a rising demand — mainly in China — for shark fin soup, a highly prized symbol of wealth. Because of their long life spans and low fertility rates, sharks are vulnerable to overfishing. Within its EEZ, a nation may regulate fisheries and scientific research and develop other economic efforts. The U.N.'s Food and Agriculture Organization estimates more than half of highly migratory sharks are overexploited or depleted. Toribiong said a recent flyover by Australian aircraft showed more than 70 vessels fishing Palau's waters, many of them illegally. "We'll do the very best we can, given our resources," he said. "The purpose of this is to call attention to the world to the killing of sharks for commercial purposes, including to get the fins to make shark fin soups, and then they throw the bodies in the water." Tourists go to Palau for its spectacular diving in the tropical waters, dramatic coral and rich marine life. The remote Pacific nation recently made global headlines when it agreed to President Barack Obama's request to take a group of Uighurs — Turkic Muslims from China's far western Xinjiang region — as part of plans to close the Guantanamo Bay detention center. 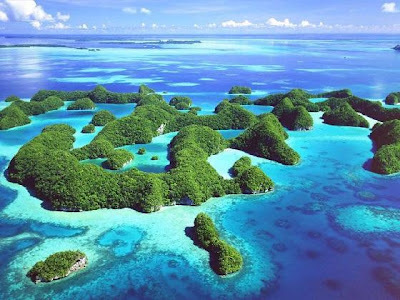 Palau is one of the world's smallest countries, with some 20,000 people scattered over 190-square mile (490-square kilometer) archipelago of lush tropical landscapes in the Western Pacific. Its shark sanctuary will shelter more than 135 Western Pacific species of sharks and rays considered endangered or vulnerable, or for which there is not enough data to determine how the species is faring. "Palau has basically raised the bar for the rest of the world for shark conservation," said Matt Rand, director for global shark conservation for Washington-based Pew Environment Group, an advocacy organization. Elsewhere, Europe is trying to crack down on shark fishing in its waters. In February, the European Commission proposed its first-ever shark conservation rules for European waters. EU countries account for a third of shark meat exports globally, and shark steaks are increasingly served in restaurants, replacing pricier swordfish steaks, and shark products are also finding their way into lotions and leather sports shoes. Toribiong said he also will call for a global moratorium on "shark finning" — the practice of hacking off shark fins and throwing the body back into the sea — and an end to unregulated and destructive bottom trawling on the high seas. Palau is among 20 seafaring nations that already have voluntary agreed to end bottom trawling, which involves fishing boats that drag giant nets along the sea floor. Enormously effective at catching fish, the nets from bottom trawling also wipe out almost everything in their path, smash coral and stir clouds of sediment that smother sea life, marine experts say. The U.N. has called bottom trawling a danger to unique and unexplored ecological systems and said slightly more than half the underwater mountain and coral ecosystems in the world can be found beyond the protection of national boundaries. PS the president's remarkable address to the UN is right here! And indeed, who is the operator who facilitated it??? Underwater Thrills have weighed in with this unequivocal condemnation. Will somebody, please, put a stop to this? This is the best image, ever, of one of our Giant Groupers, Ratu Tolu. Copyright Tim Rock 2009. This guy - yes u gotta check him out by yerself! Timbo and I go back to the epic 2002 Voyage of Discovery where we spent several weeks aboard the Pelagian prowling the remote atolls of Micronesia. And despite the saying that boats are like prisons, with the added risk of drowning, we did not have a single fight but became pals instead! And lemme tell you: others were not so lucky! And I'll leave it at that! We've been in touch ever since and even managed to hook up sporadically at DEMA and once, in Tonga - but despite of my constant prodding, he had never quite made it over to Fiji. And I don't blame the man. To the uninitiated, my Fijian tales sound quite too good to be true - and haven't we all eagerly packed our bags and traveled to the most secret and guaranteed diving hot-spots, only to inevitably get terminally skunked upon arrival! Well, he has finally managed to pay us a visit. He did -cautiously- add one week of Sharks to swimming with the Humpbacks in Vava'u and I guess it would be fair to say that we managed to impress him. And his charming model Yoko! The Bulls were kinda skittish as this is the prologue to their mating season where they don't feed - but when they did turn up, they were big and close! Let's say that I do know for a fact that they did get his attention! Tim is what I call a real underwater photographer, somebody who does it for a living. His preliminary portfolio is a testimony to his diligence and to the fact that he's a master of his craft - above and underwater. We've been hatching some plans and you shall be hearing much more as they evolve. River Sharks - no Drama! Did I really say tomorrow??? Well, as we all now, Time is relative. Enter Fiji Time, like Tonga Time a hitherto largely overlooked third consequence of Einstein's Theories of Relativity! Stan and Jone have once again done an outstanding job and delivered a well-rounded and informative piece of pro-Shark media. You may want to note how real Pacific Islanders perceive Sharks as a natural and unspectacular element of the Marine ecosystem: none of drama and stupid generalizations that are so typical of the various pundits and armchair warriors polluting the blogosphere and the mainstream media. Case in point, check out this evil abomination: mind you, "reporting" about the exact same topic! And compare it to the hysterical hypocrisy of the so-called "natives" over in Hawaii! This, and an upcoming spectacular paper by Eroni, Victor and Juerg are the results of our road trip in July where we set out to find Fiji's Bull Shark nurseries. We have found them - and much more! What really blows me is the interview with Rusi.. If anybody deserved the title of Shark Whisperer, it would really be him. He is normally silent and outright humble - but put him in front of one of his beloved Sharks and his personality changes completely and his understanding of the animals and the way he interacts with them are just simply totally unreal. Over the years, we've hosted our fair share of visiting "experts" - and every single one of them has told us how incredibly impressed they were by how Rusi handles the big Sharks. I cannot begin to tell you how personally rewarding it is to now see him come out of his shell and talk (!) for minutes (!) about the need to protect them! Vinaka Rusi, you are simply the best! Gary is of course one of my heroes. He has been part and parcel of the Fiji Shark Project since its inception and regularly pops by to inspect its progress and to assist in Juerg's ongoing research projects. His help and his guidance have been invaluable and the Fiji Shark Dive is as much his baby as it is ours - and I may add: much to the contrary of the progress in the help and guidance Juerg and yours truly are trying to extend to Gary! That has been an abject failure! But as usual, I'm digressing. So here it is: Enjoy! Kim Holland is a good guy. He is also a brave man. Instead of kowtowing to the virulent Hawaiian anti-Shark witch hunt, he has come out with an unequivocal response to the allegations that the ground-breaking paper he has co-authored (yes that would be the "Meyer paper") may in any way be "suspect". Kim leads the world-renown "Holland Lab" of the University of Hawaii and his research is regularly coming up with fabulous insights into Shark behavior. This is what he's got to say. 1) The paper was not based solely on data from tour operators. 2) The operators' information was provided prior to the recent turmoil; there was no incentive for false reporting. 3) The paper was only published after review by independent experts. Soon-to-be-published results of shark tracking research show that sharks found at the tour sites don't come close to shore. Several elected officials such as Mr. Knudsen took public positions on this topic before they had sufficient objective information or after listening to "instant experts." Apparently, ego now prevents them from changing their minds even though the scientific facts do not support their opinions. Objective data indicate that the tours do not cause increased risk to humans and do not significantly impact the biology of sharks. The tours do provide local employment and they probably increase the general public's appreciation of marine life and how worthy these resources are of our respect and protection. Everything else is just demagoguery of the very worst kind. But we knew that already, didn't we. PS Underwater Thrills have just weighed in on the issue. One of my pet grievances is the seemingly hopeless and certainly senseless and wasteful fragmentation we witness in Conservation - and here comes the new Shark Safe Network that tries to coordinate among many different Shark Conservation NGOs. We're obviously proud that the home page features our Fijian pro-Shark PSA and that our Fiji Shark Conservation and Awareness Project has been deemed worthy of inclusion among the Member Organizations. Do I also cringe at some of the names we are being associated with? You betcha! I'm as intolerant, biased, opinionated, solipsistic and prejudiced as the best of them! After all, I'm a Sharkaholic - as tribal, back-stabbing and petty a people as any other self-respecting closely knit group where everybody knows one another and many have years of shared "history", be it life-long friendships or irreconcilable enmity. But let's never forget that despite of all the controversies that regularly have our tempers flaring, we all share a great common love and concern for the welfare of Sharks and the Ocean in general. And yes, at least one fantastic pro-Shark Initiative is missing in the lineup! C'est l'amour, c'est la guerre! Please take some time and explore the website and its wealth of information, suggestions and campaigns. It's the brainchild of a passionate and anonymous Shark Conservation activist who has invested countless man hours into what is clearly a labour of love. Kudos - and thank you for showing us the way! This one, and especially, point 5! Jack and Helen Randall in 1955 - the year I was born! Randy is a good man. He's very much at the forefront of Marine Conservation in Fiji and his FLMMA, the Fiji Locally Managed Marine Area Network is well on its way to ensuring that 30% of Fiji's reefs are being protected. The story here is that I had the pleasure of discovering that Randy has published the following moving laudatio of my friend Prof. Dr. John E. Randall, nicknamed Jack, in Fiji's lifestyle magazine Mai Life. Please click on the pictures to read it. In brief, Jack is the world's most eminent Fish Taxonomist, full stop. And this by a long long stretch! He has described more Fishes, authored more papers , groomed more authoritative Fish Taxonomists, published more Fish ID reference books and very generally, contributed more to Ichthyology than anyone alive. You would never suspect it as nobody could be more genuinely friendly, witty and modest: but Jack is truly larger than life (and I know he will hate me for having said this). In fact, he has scoured the Oceans so thoroughly that some of his his disciples have resorted to go and explore the twilight zone in order to have a chance of running across something new! Well, Jack has obviously the advantage of having been around forever, right from the very beginning of SCUBA and at a time when the Ocean was still largely pristine, unpolluted and teeming with life. Read this! I had been given my long-john underwear when I was discharged from the army, so I dipped it in a wash basin of latex rubber, hung it up to dry, and may have had the first wet suit. The first swim fins in those early days of skin diving were shaped like frog feet, and the face masks were perfectly round with narrow hard rubber edges that one had to fit to one's face by careful cutting and sanding. 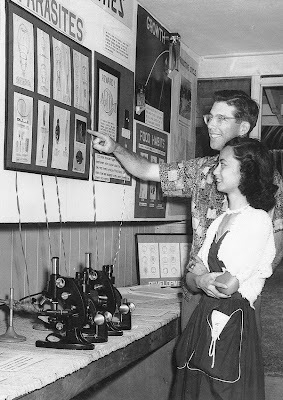 Jack has been with the Bishop Museum for over 40 years now and I sure hope that those guys will never forget the immense contribution he has made to their standing within the scientific community - and prima vista, they do. the Museum’s fish collection compares favorably with other museums in the U.S. (except the USNM and the California Academy of Sciences, which has the combined collection of CAS and Stanford University). Bishop Museum has 2,875 lots of type specimens of fishes, of which 698 are primary types (holotypes, lectotypes, and neotypes). The American Museum of Natural History in New York has 523 primary types of fishes; the Los Angeles County Museum of Natural History has 226, and the Scripps Institution of Oceanography 205. Vinaka Randy, this was most timely and very kind! Yes, I'm referring to none other than Uncle Charlie! Let me remind you of his contribution to the Shark feeding ban in Maui. Kahu Charles Kauluwehi Maxwell Sr. reminded council members that many Native Hawaiians honor sharks as aumakua, or guardian spirits, and said treating the animals as entertainment was invasive and disrespectful. "Any time you organize a tour to look at the mano (shark), you're disturbing their environment," he said. I found it hypocritical then - but now that I know what he does, I'm just simply stumped. In a previous post, I've blogged about a breed of Pacific islanders who make an excellent living in bullshitting the ever-so-politically-correct and google-eyed Palangi with pseudo-cultural mumbo jumbo which they make up on the fly. They exploit the all-pervasive bad conscience of the previous conquerors and colonialists and know all-too-well that for lack of any written tradition, Pacific culture was handed down orally and that as a consequence, it is virtually impossible to verify, and especially, to refute those claims objectively - however far fetched and preposterous they may be. In the softest possible way, Hawaii is a most fertile breeding ground for unscrupulous ethno-scamsters, native and Haole alike - and good old Charlie seems to have carved himself a most convenient little niche smack within the tourism industry in Maui. Maxwell (also known as "Uncle Charlie") along with Sam Ka'ai and other respected Hawaiian practitioners are part of an elite group of Hawaiian Cultural Advisors who share their mana'o (knowledge) for Maui Ocean Center's various educational and conservation programs. In addition to paying homage to Hawai'i's 'aumakua, these guardians also contribute to the marine park's standard of operations and service, preside over blessings of important functions and facilities, as well as empower and train employees through their love and respect for the island's host culture. ... stopping the practice of using the "Aloha Spirit" to lure tourist to these islands pretending that everyone is "spreading the Aloha Spirit" when they are not. The visitors will have to be shown the true Hawaiian culture in dance and song and not "theatrics" of the fire and knife dancing with plastic fern leis. If the visitor industry proposes to keep tourism then they, along with the state of Hawaii, will have to keep promoting every phase of the culture. as he himself wrote in 1997! So let's examine his culturally relevant contribution. This is what I read with awe on the Maui ocean Center's website. 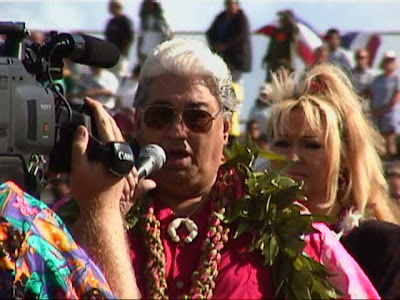 Even before the marine park officially opened its doors on March 13, 1998, the Hawaiian Aquarium paid respect to Hawai‘i’s cultural legacy by building a ko‘a (fishermen’s shrine) on property. Located on the left side of the Seascape Ma‘alaea Restaurant, this structure was erected days before the facility’s opening and was dedicated to the ‘aumakua mano (shark guardian) of “Uncle Charlie” Maxwell’s family’s ancestral gods who come into the bay of Ma‘alaea. 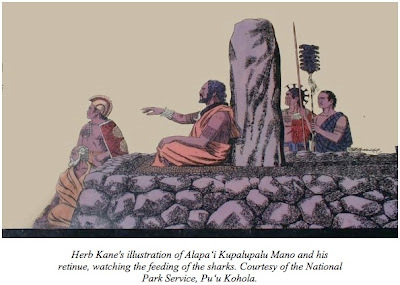 The pohaku (stones) to build this fisherman’s shrine were gathered from Maxwell’s family ancestral home in Ukumehame, about seven miles (Lahaina side) from Ma‘alaea. When these stones were brought to the marine park, it rained continuously until the structure was built. As soon as the last stone was placed on the ko‘a and the chanting started, the rain stopped. Hawaiians called it hoailona (a sign of good luck). The next day, the tiger sharks came to the Maui Ocean Center. Yes, the Center displays Sharks, i.e. Tiger shark, hammerhead shark, blacktip reef shark, grey reef shark, whitetip reef shark, sandbar shark, spotted eagle ray, broad stingray, and dozens of species of tropical reef and pelagic fish! ... when a shark is brought into or released from the aquarium, it is blessed by one of Maui Ocean Center’s Hawaiian cultural advisors, for sharks are considered na ‘aumakua (deified ancestors or personal gods) by old Hawaiians. Do you really believe that under ancient Hawaiian culture, there is a ceremony for blessing Sharks that are caught and brought to an aquarium? So, do those Sharks "come" - or are they collected exclusively from waters around the Hawaiian Islands? If the mere looking at the mano is disturbing their environment, how about catching them? Uncle Charlie: Is catching and keeping Sharks in captivity disrespectful of the 'aumākua?? This is what the less, uh, polished native Hawaiians think about a recent slaughter of Sharks - sanctioned by the State of Hawaii Shark Task Force where Uncle Charlie sits as a Hawaiian member! Which brings to mind the next question: are those captive Sharks been kept hungry? Or may it be that somebody is -anathema!- feeding them? So, Uncle Charlie, is feeding captive Sharks disrespectful of the 'aumākua?? 4. 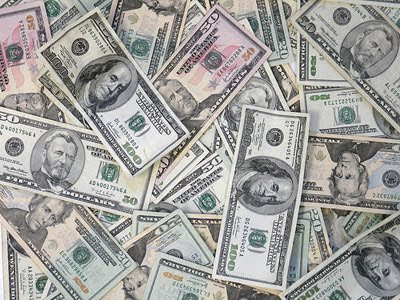 Displaying Sharks for Money? 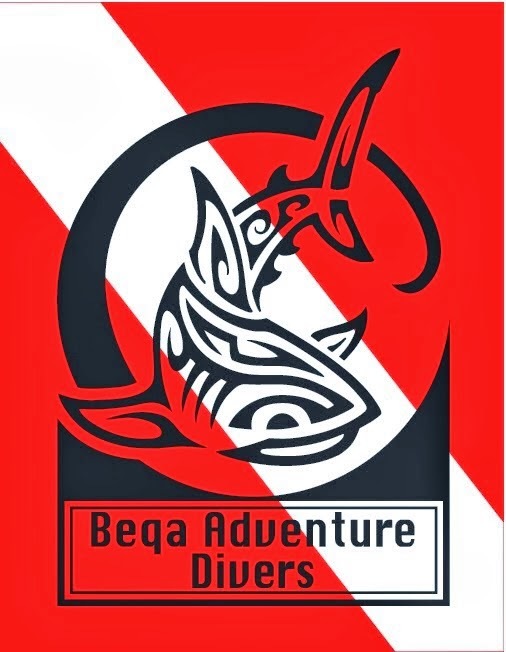 And what about the Shark dive, where people pay 199 bucks to go and dive with those poor captive Sharks? Remember the sage words of the great Uncle when Maui passed the infamous Shark feeding ban? Uncle Charlie: Is displaying captive Sharks for entertainment and for commercial purposes disrespectful of the 'aumākua?? ... shark tours, the practice of charging residents and visitors to venture into ocean waters to view sharks attracted by fish feeding, .... is disrespectful of Hawaiian culture, alters the natural behavior and distribution of sharks, and may be disruptive of ocean ecology and the natural environment. But catching, and then displaying and feeding Sharks in the Maui Ocean Center is none of the above - because of Uncle Charlie's blessing and obvious approval? In US popular culture, there's already an infamous "Uncle". As of today, I've added another one to my very own personal vocabulary. Hawaii's tourism industry is reeling under the effects of the most severe recession since the Great Depression - and yet, a few demagogic zealots are allowed to pursue their anti-Shark witch hunt in total impunity and to further destroy the tourism industry in the process. The recent ban of Shark tours in Maui is preventing any future developments that could integrate the island into the global 300 million Shark viewing industry. Due to stupid legislative language, it may well also destroy one of the island's principal tourism attractions, the Shark Dive in the venerable Maui Ocean Center. Land-based Shark tours, i.e. diving with Sharks in aquaria, are clearly the next big development in Shark tourism and Maui's tourism industry is now firmly out of that loop forever. Talk about shooting oneself in the foot! Oahu could have been the great winner of that short-sighted decision, like the Bahamas who became the world's foremost Shark diving destination after Florida banned Fish feeding in 2002. Instead, the same zealots are on the verge of having a similar ban enacted by the Honolulu City Council. That ban would effectively destroy one of the island's multimillion tourism attractions, the two existing Shark viewing operations that go and look at Galapagos and Sandbar Sharks 3 miles offshore from the safety of purpose-built cages. That's 40,000 tourists each year contributing in excess of 80 millions to local tourism. This is what you get when extremists are left free to pursue their evil, and stupid agendas. Let's be very clear about this, lest anybody later claim that they just didn't know better. the great cultural, historical, and spiritual significance for many Native Hawaiians, as the tours in no way disrespect Hawaiian culture. Killing Sharks does. 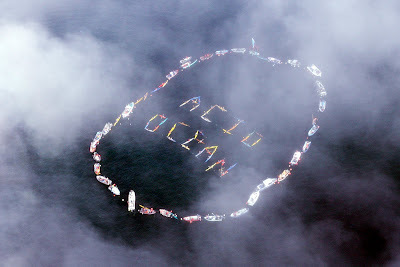 endangering the safety of ocean users. The latest scientific research proves the exact opposite. If at all, those who endanger the public safety are the fishermen and the spearos. altering the natural behavior and distribution of sharks, and being disruptive of ocean ecology and the natural environment. Killing Sharks is. This is about a baseless political fear campaign waged by a minority and alas, tolerated by a majority who obviously lack the interest, the energy or the spine to speak up against the shenanigans. It is the same majority who will bear the economic consequences if the Honolulu ordinance gets ratified. Like in the case of Florida, they will simply take their tourist dollars elsewhere, to a destination that offers the full spectrum of aquatic recreation and that is not the playing ground of self serving and hypocritical eco-impersonators. 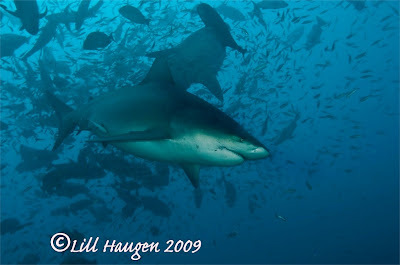 Oahu is a major hub in the Shark fin trade and the Hawaiian game fishermen continue to target and kill Sharks. Those are the very circles that have spawned the infamous Shark Task Force that is now dictating their anti-Shark agenda to the silent majority and destroying Hawaii's tourism industry in the process. It may be late but the cause is not completely lost. Let's hold the powers that be accountable for their actions. Underwater Thrills have posted the e-mails of all Honolulu City and County council members and a specimen letter to them. Here they are - please write to them. Dear Council Member, I am writing on behalf of North Shore Shark Adventures and Hawaii Shark Encounters based on the North Shore of Hawaii. Both of these operations represent 40,000 shark tourists each and every year to your island. Both have been in business for close to a decade representing the finest example of sustainable and safe eco tourism operations. I am sure you are aware of a recent shark study done by the University of Hawaii that indicates the animals of the North Shore do not follow these vessels back into shore as has been alleged. There is no man made shark safety issue with current shark tourism operations in Oahu as has been the case for close to a decade. Your decision to ban shark tours will shut out 40,000 tourists from the North Shore. While Maui has banned shark tourism they have also provided Oahu with an unexpected boost to it's local economy. Tourists do not like to be shut out from tourism opportunities. An adventure tourism seeker will choose Oahu over Maui knowing they can dive with sharks safely and sustainably when presented with this ban. This is an unexpected "tourism opportunity" handed to you by Maui that you can support or destroy with your vote. Shark tourism represents a $300 million dollar global industry. When short sighted local governments in Florida banned shark tourism in 2001, Bahamas shark tourism quickly grew to a $70 million dollar a year juggernaut. Adventure tourism seekers represent the fastest growing segment of the global tourism market. These tourism seekers typically vote with their wallets. Consider your vote in this matter carefully. The world is watching what Oahu does with this proposed shark ban. Will Oahu be known as the island that understood all aspects of tourism or the island that was lead by unsubstantiated fear based shark hysteria into destroying successful and safe shark tourism? Do you want to be known as the politician who drove 40,000 shark tourists to other global tourism destinations outside of Hawaii? I shall be able to post it tomorrow! Gone - probably forever . Joe Borg sure talks the talk. His assessment of the Achievements by the EU Fisheries Commission he heads proudly claims this. Achieving sustainability in biological, economic and social fields has been an ongoing challenge. The basis of the Commission’s work has been to regain a sustainable resource base to allow EU fishermen to secure a viable future. This will also be a crucial objective for the European consumer whose expectations for healthy and sustainably-caught fish products are ever increasing. In order to put fisheries onto a firmer sustainable footing, the 2002 reform of the CFP foresaw a move from a short-term approach towards long term plans for major stocks in EU waters. These plans include a number of provisions for conservation measures aimed at preventing fi sh stocks from being overexploited and restoring them to levels that can produce maximum sustainable yield. These measures seek to avoid that the pressures of fishing activities targeting certain stocks jeopardise the reproductive capacity of the stocks concerned or puts them at risk of collapsing. A number of such plans have already been established whilst others are expected to be adopted by the end of 2009. Well well, all very impressive indeed! But how about walking the walk? Like all of the apex predators in the Atlantic, the Atlantic Bluefin Tuna is all but gone and the EU is seriously contemplating having the species listed under Appendix I of CITES. If backed, this would result in an effective trading ban for all CITES members. It would also effectively remove the issue from the direct control of the EU and its increasingly controversial Fisheries Commissioner who attempts to procrastinate further by asking for the usual "more data" - a scam that even game fishermen (!) decry. What part, exactly, of Biologically Extinct does Joe not understand??? Thing is, Borg hails from Malta and the Maltese are obviously not amused, as the ban would apparently jeopardize the livelihood of the majority of their fishermen. As always with fisheries politics, it's the Tragedy of the Commons pure and simple: never mind the the consequences - as long as you can continue to reap and pillage! And guess who's responsible for the drastic decline in stocks in the first place! Malta is a major operator of Tuna pens. As Greenpeace puts it, fishers corral schools of half-grown tuna and tow them in floating pens to marine ranches where they are fed and fattened until they can be killed and shipped to Japan. There are rules banning fishing fleets from taking undersize tuna out of the Mediterranean, but none that prevent catching immature tuna and fattening them in floating pens. Every country on the Mediterranean (except Israel) takes advantage of this loophole and maintains tuna ranches offshore. The fishers from Spain, France, Italy, Greece, Turkey, Cyprus, Croatia, Egypt, Libya, Tunisia, Algeria, Morocco and Malta are capturing half-grown tuna by the hundreds of thousands. If you had to design a way to guarantee the decimation of a breeding population, this would be it: catch the fish before they are old enough to breed and keep them penned up until they are killed. On top of that, existing fish farms have harmed the environment, polluting coastal ecosystems and putting additional pressure on wild fish populations by spreading disease and toxic chemicals. According to our friend Alex, the Maltese farms spread a diabolical stench and have already led to the pollution of several beaches and the demise of several of Malta's premier dive sites. Borg's term is due to expire at the end of this year and Malta would have to re-nominate him. Will he once again pander to his constituency - or will he see the light and ensure that his legacy will include having turned around the fate of the Mediterranean's most iconic predator? Call me a defeatist - but I remain skeptical. "Europe" being "Europe", the decision by the the Commission is yet again a compromise inasmuch as the ban will be subject to the "latest assessment" by the International Convention on the Conservation of Atlantic Tunas. So far, ICCAT's track record in terms of conservation has been nothing short of ignominious and there's no reason to assume that they will not try their very best to have the ban stalled or revoked altogether. Believe it or not, this table dates back to 2001! Fingers crossed that I'm wrong! Compare the shape of the snout! This is Adi, our small princess. Stumbled upon a strange piece of news. A Shark was "found floating" and was then "captured". Upon inspection, it contained body parts of somebody who had gone missing. 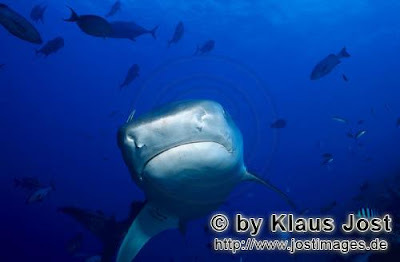 Maybe - but the Shark is definitely not a Bull Shark, but a Tiger Shark! Check out picture #2 and you'll be able to notice the typical patterns on the tail and the equally typical large pupil. Don't we just love our media! Check out this video by the Save our Seas Foundation! 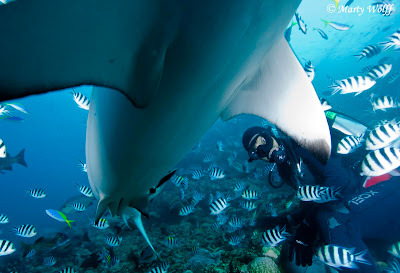 Feeding Frenzy-Manta Rays of the Maldives from Save Our Seas Foundation on Vimeo. Andrew is disgusted - again! September 9, 2009 in the Gregorian calendar happens to coincide with the beginning of a Mayan Sacred Calendar count of 260 days. Hence, in this calendar, in use since 3000 years, the modern date 9.9.9 has the energy of Hun Imix, or 1 Alligator as its English translation reads, which happens to be the first of its energetic combinations. If we ponder what this synchronicity may be telling us the most natural conclusion to draw is that on this particular date we are called to focus on the number nine and especially the Ninth level of the Mayan calendar system, whose coming into existence we are soon about to witness. Xiuhtecuhtli is the name of the god who gives energy to this 20 days period, it is a god who reign over the year, a god of fire, the creator of all life. Xiuhtecuhtli is also known as Huehueteotl, the oldest god, be considered as Mother and Father of all gods, he is at the centre of the world. Personality of this god is to see the light in the darkness, feel heat in the cold, to feel content despite hunger and to understand life after death. Number 1 stands for this God. Beginning of all. 9/9-09 is the first day in a new tzolkinrunda, a new period of 13 ST 20 days periods. This period is a further period of higher energy. Beginning of all. This first period of energy can give You the chance to respond to the challenges with the aim of resolving them in a new way. Attempts to solve a problem with a different way of thinking. Create thee a new basis, which love and creativity is the base in everything You do. You will see that your surroundings are doing the same thing when they see Your results. Please be aware that when you meet with a challenge in life, it is for You to learn more. This period can show you how light is created out of the dark. It is a period that can give You much happyness if You only allow it. The challenge for many is to dare be loved, dare feel loved and to love. Learn and remember: I am love! In the case of September 9, 2009, 11 shines bright and brings a strong sense of awareness and compassion -- as well as intuition -- to this date. There is an undercurrent of interconnectedness, of brotherhood. 11 is the diplomatic peacemaker and the number of the heart, but is probably best known for drawing people together. To go a step further, consider this: one of the darkest of human tendencies is to separate ourselves from our fellow man, to alienate. This makes it possible for mankind to cause death and mayhem among their own kind. When that sense of distance is lessened, we are unable to cause each other such profound pain. As you enter towards the portal of 9:9 – know that it will be a point of completion. It is a point of pause. Like the Divine Mother that I am but now as the Divine Feminine encompassing all sacred feminine archetypes – it is time during the pause of the 9:9 Divine Feminine Portal to express your Goddess Spark. It matters not whether you are man or woman in body – for this has always been part of your expression not the whole representation. It is the merging of all that is you – in the same way that we have merged all that was Divine Feminine, that we ask you to honour your Goddess Spark. The Goddess energy is about love through play, it is about nurturing with love, it is about creation with love, it is about abandoning the confines of the mind and merging the mind and heart. The Goddess energy that we emit is light – and bonds with you like sparks of light. Each spark expanding you and supporting the creation of the new you! For it is not just those who are in light who are renewed – each of you has undergone the experience of a re-birthing. The shift in moving forward – and for those who still feel their movement has been prevented or distracted – just understand that you are still moving forward and that the purpose in delay has been the choice of your soul. It is now time to speak to your soul through your heart, with love and bring it forward to be part of this new earth. There is a unique alignment of the number 9 about to happen - on the ninth day of the ninth month of the year 2009 AD at the ninth one hundredth past the ninth second past the ninth minute of the ninth hour. The sum of these numbers consistently stays 11 – at whatever resolution of unit of time one may decide to stop. The number 11 is a Master number. Master numbers are the only exception to rule of reducing to the single digit. The master numbers 11 and 22 are intensified versions of the single digit number they replace (2 and 4). 09.09.09 is an “Opening of the Lotus Grid”. This is a beneficial release of energy from the Earth’s heart chakra. There are Lotus Grid openings each year from 2006 to the end of the Mayan calendar on December 22, 2012. The “special days” are: 06.06.06, 07.07.07, 08.08.08, 09.09.09, 10.10.10, and 11.11.11. There is another group that is assembling on Mount Magazine, Arkansas for a massive energetic release that is supposed to occur on 09.09.09 from the crystal formations inside the mountain. Because of all of the above! And because today is his birthday! May the 1 Alligator help him express his Goddess Spark! Florida's Lemon Sharks in Trouble! 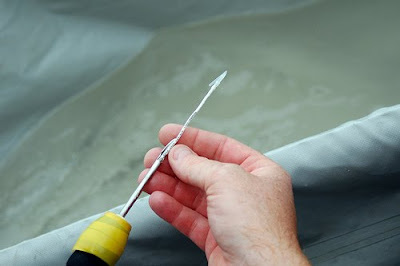 From the Shark Safe blog. As regulations tighten for other fish, lemons sharks and other large coastal shark species - already in trouble! 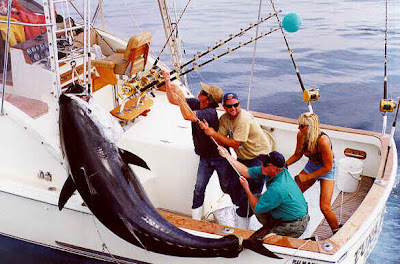 - are facing increased fishing pressure. The Florida Fish and Wildlife Conservation Commission is seeking feedback from the public on options for amending its shark management rules. Commercial fishermen are gearing up now to target the winter lemon shark aggregations off Florida's coast. It's critical that as many people as possible speak up in support of greater protections for lemon sharks and other highly vulnerable large coastal shark species. 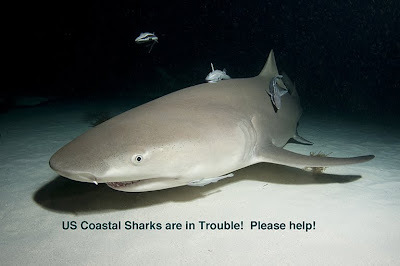 Please join Dr. Samuel Gruber, Walt Stearns, publisher of the Underwater Journal, and others who are concerned about the fate of Florida’s sharks in this effort to save lemon sharks and other highly vulnerable sharks. Lemon sharks take 12 to 15 years to reach maturity and then only mate once every two years, have long gestation periods and give birth to a small number of young. These slow reproductive characteristics, very high first year mortality destruction of lemon shark nursery habitats, combine to make this species extremely vulnerable. The lemon shark "aggregations" - large gatherings that take place off the coast of Florida in a small regional area close to shore with a highly predictable time frame, also make them easy targets for fishermen. Satellite tagging studies have proven that the lemon sharks that aggregate off Florida’s coastline have come from all up and down the East Coast of the US and the Bahamas. Commercial targeting of Florida's lemon shark aggregations can severely deplete or even wipe out lemon sharks populations very quickly and will impact a large geographic area. This is a potential shark conservation disaster! If at all possible, please attend this meeting and ask the FWC to add lemon sharks to the Prohibited Species List. I'm still pissed off whenever i read it. I'm referring to this announcement that some council on Maui has decided to ban all Shark tour businesses in the County. Mind you, pre-emptively, as there are no such businesses there! Some other council has obviously just ratified it. It's not the decision in itself, although I find it really bizarre. It is statements like "I believe the commercialization of a religious symbol that's so important to the host culture is inappropriate" and ...the bill prohibiting shark tour operations in Maui County was a matter of respect for Native Hawaiians who consider the animals sacred and especially, the following that really gets me going. 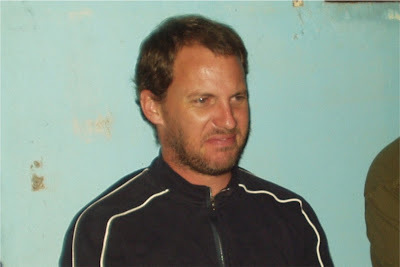 Well, I initially reacted angrily and wrote a scathing post about the natives playing the reverse racial card on the naive google-eyed Palangi and their oh-so-politically-correct bad conscience. When Patric of Underwater Thrills took it onto himself to fly to Hawaii in order to mediate between the warring factions, I retracted the post as a token of good faith as I was told that it was detracting from the efforts to find a consensual solution. That solution has been found - and I'm still waiting to see if the rep. Gene Ward will keep his end of the bargain and finally distance himself from the demagogic rubbish posted by the Shark Task Force and their infamous Safe WatersforHawaii website. But back to the allegation that viewing Sharks may be disrespectful to Hawaiian culture and their belief in the 'aumākua. Here's what our wise, and wisely anonymous Hawaiian has to say about the topic. BAN LOGIC #1: Shark tourism is disrespectful and offensive to Hawaiian culture and religion because it uses sacred amaukua for entertainment purposes. SMELL TEST A: Native Hawaiians venerated many creatures from the natural world as aumakua, including various birds, fish, sea turtles, dolphins, and whales. Has this government body banned bird-watching, whale-watching, or any other type of wildlife viewing tours based on the logic that they are disrespectful to Hawaiian culture? SMELL TEST B: Workers in the recreational fishing industry frequently deal with sharks that attempt to feed on their bait or catches by tossing baited hooks with floats into the water so that the shark will hook itself and then die painfully of starvation while fighting against the float. Is this disrespectful of the aumakua? Has this government body banned this practice? Pretty darned straight-forward and revealing huh? What really baffles me is Maxwell's statement in the matter. a very well respected "Kupuna" (Elder) in the Hawaiian Community and all throughout Polynesia. "Uncle Charlie", as he is affectionately known, is also the curator and cultural consultant, for sharks at the Maui Ocean Center and is linked to sharks spiritually. In ancient times, families were careful not to eat certain forms of animal life if their 'aumakua was thought to appear in that form, for if they did, they knew the punishment could be as severe as death. And this, by none other than the revered uncle himself! So, Uncle Charlie, what happened? Why do you suddenly side with people like Makani Christensen, the president of the Shark Task Force and a notorious Shark hater and Fish killer? One can say many, mostly stupid things against the Shark tour operators. But one thing is unequivocal: that they love Sharks and contribute to dispelling the myth of the killer beasts. And that they often enable Shark research and are often engaged in Shark conservation. Case in point: Stefanie and her Hawaiian Shark Encounters. Her website (and that of North Shore Shark Adventures) is brimming with pro-Shark messages and on top of that, she has even started a Shark protection org, Shark Allies! How much more respectful of the 'aumākua can anybody possibly be? Shouldn't the native community, especially those who are spiritually linked to Sharks, respect and thank those people instead of reviling them? And shouldn't prominent Hawaiians like Uncle Charlie stop being hypocritical and invest all their energy and cultural might into combating the real problem, i.e. the relentless extermination of Sharks by the spearos, game and commercial fishermen - and the resulting degradation of Hawaii's reef habitats? Hawaii Smell Test - it stinks!